Hello everyone it was a rainy day yesterday, but we do need the rain in Northern Jersey. The pups were not thrilled. No rolling in and chasing leaves in their large puppy run. This is a HUGE thing for Peanut and Reese, they love it! Today is nice and sunny so they can have their play time. You may remember this snippet in my last post and I teased about making a change to a table in the kitchen. Well, I am here today to show and let you know what I did. 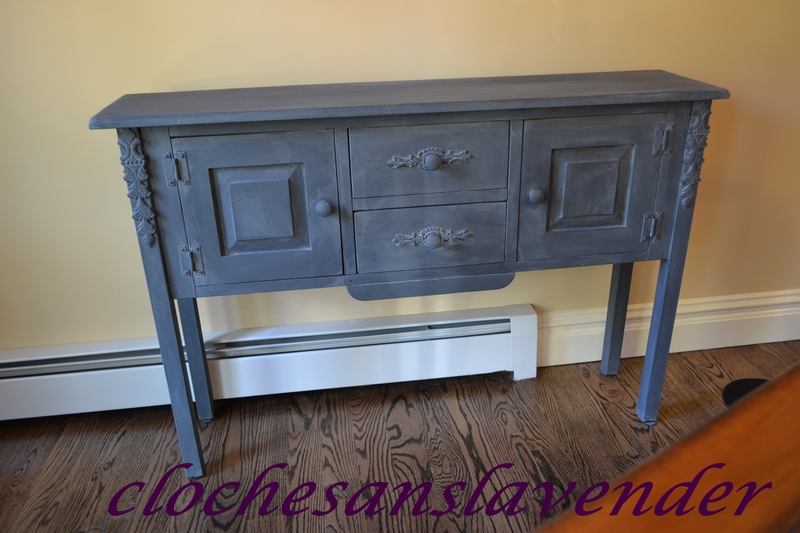 This table is beside the kitchen table in our eating area and is open to the Great room. I felt they needed to feel connected, so, I transformed this table I did years ago in ivory with glaze to age. Since the Great room has many black accents, I decided to paint this piece using ASCP in Graphite. John purchased a Wagner paint sprayer and thought he would spray this for me. A big help, and it turned out great, don’t you think? After this coat dried for a couple of days I decided to take this one step further. 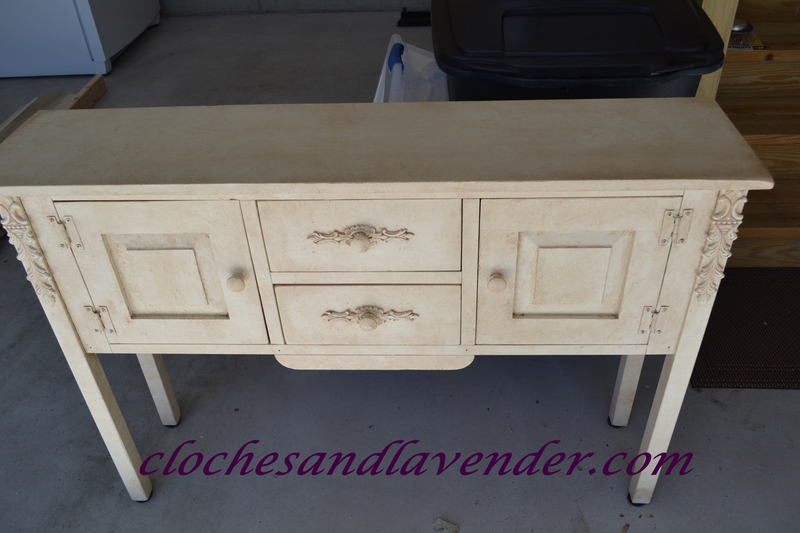 I used the color French Linen in ASCP and watered it down. I wanted to add a layer to help with the aging effect. Once this was dry for another day the waxing began. I have finally gotten the groove of waxing. Reading many tutorials I think I learned the secret, patience. 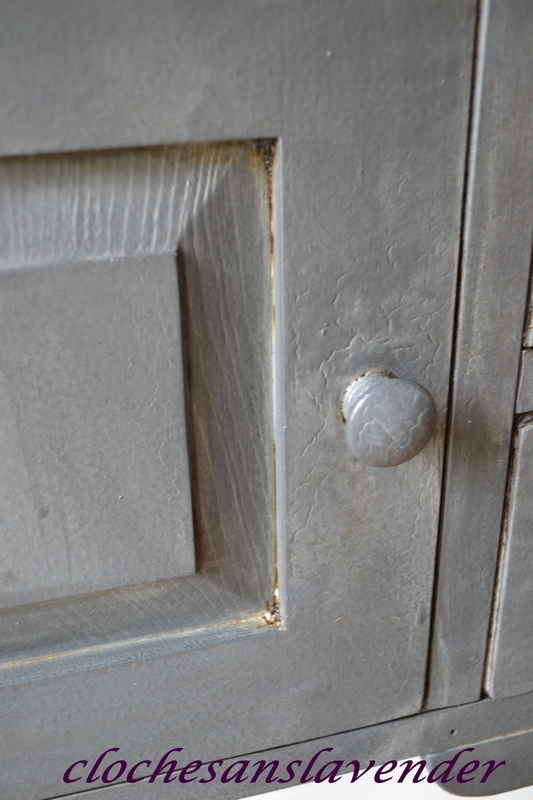 Apply a good coat of clear wax first and rub the clear wax into the paint well. Once the clear wax was dry, I began applying the dark wax and WOW the transformation really came out. 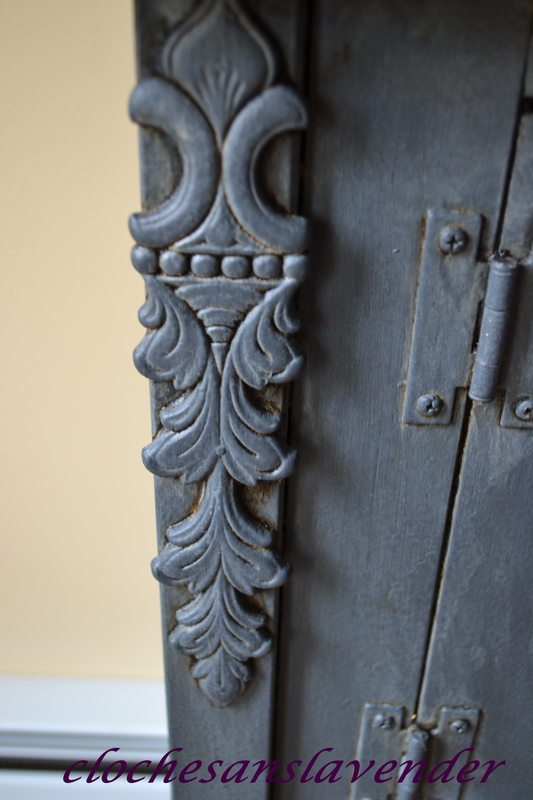 I made sure I applied a generous amount of dark wax to the details, I really wanted these to pop. I also applied wax to the grooves really well and then rubbed this into the paint until I achieved the look I wanted and did I, YES I did, I LOVE the way this piece turned out! It works beautifully with the other room and it works much better with the kitchen as a whole. I also think it makes the table appear more grand. It adds so much to my simple fall touches. What do you think? The vignette in its spot. I hope you enjoyed seeing this transformation. Enjoy the end of your week. LOVE this Cindy. The color really makes a nice statement. Looks like the paint sprayer did an amazing job. The dark wax brought out the details perfectly. Beautiful wall grouping too. I can’t wait to have my holiday designing done so I can do some furniture painting in my rooms. I have a long list of reloves to do!! Thanks so much my sweet friend. I’m so happy with the change. Still have many painting projects on the list. Love this Cindy. The color is pretty and love the whole vignette. Very pretty, I like the new colour! That turned out great! I love that graphite color. 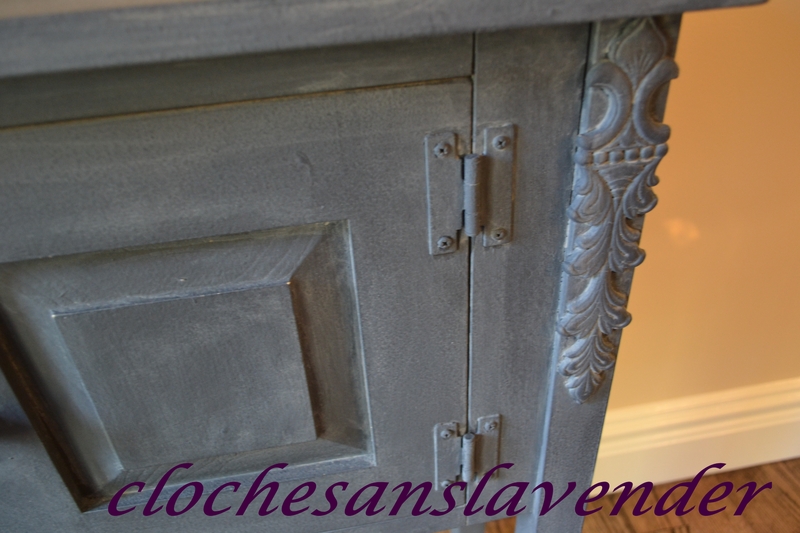 I recently bought some and mixed it with french linen and painted my chest in my sitting room. It basically turned it into a dark charcoal color rather than black. I used a dark wax on it. I basically followed the instructions given to me by the lady at the chalk paint store who holds workshops there. I like how you brushed some french linen over the graphite. It’s a beautiful transformation and each layer you added made it more beautiful. Love the French Linen wash over the Graphite!! 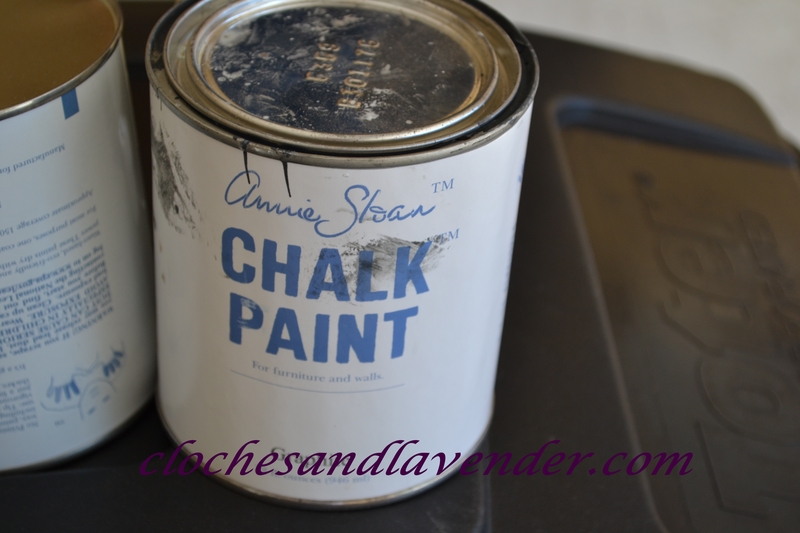 Did you thin the chalk paint before using it in the sprayer? I thought it would be too thick otherwise. Would love to try spraying it! What a time (and wrist) saver! The model he purchased he doesn’t have to thin the paint. You can but you don’t have too. Wagner Flexio 590 is the Model No. As always, you did an amazing job with this Cindy! Love that color, Cindy. Nice job. That turned out wonderful! I love it! 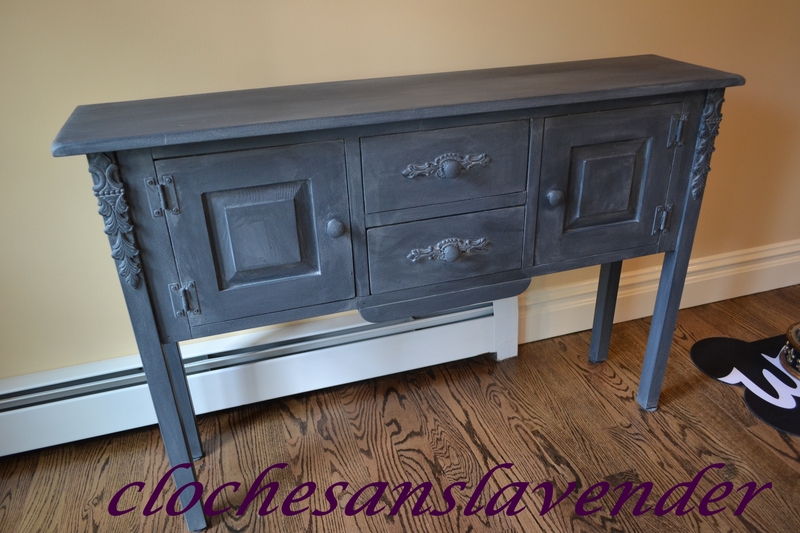 Love the color Cindy and you did a great job of distressing it! Thanks for sharing with SYC. 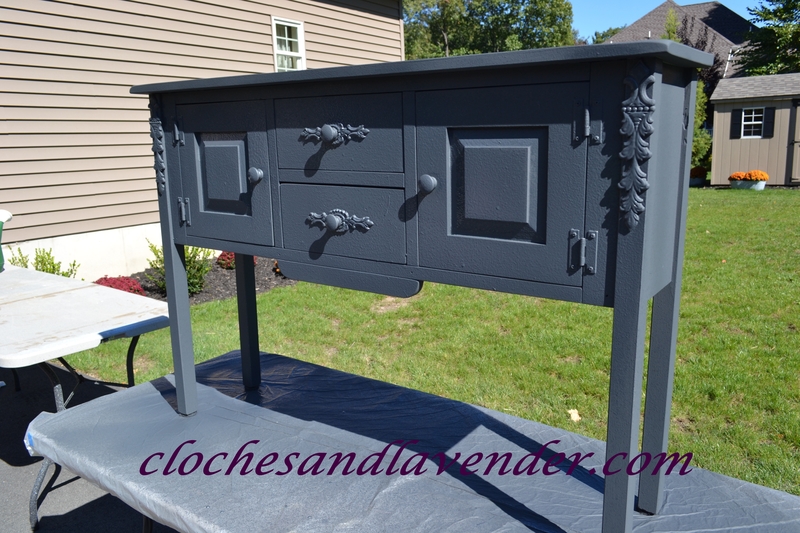 Oh how I love chalk paint! This is beautiful! Misty so do I big time!!! Now that my comments seem to be working, I wanted to let you know (like I said yesterday!) that this is one of my favorite pieces that you’ve done. LOVE the color, and the way you’ve distressed it! I love it too Amy. Before what was I thinking??? Good choice, using the French Linen wash over the Graphite. You and John make a great team. The highlighted wood grain looks beautiful. The entire piece has an aged look that’s gorgeous. I saw your link at the Creative Inspiratrions party. Thank you so much. I looked at your blog and you are a talent. 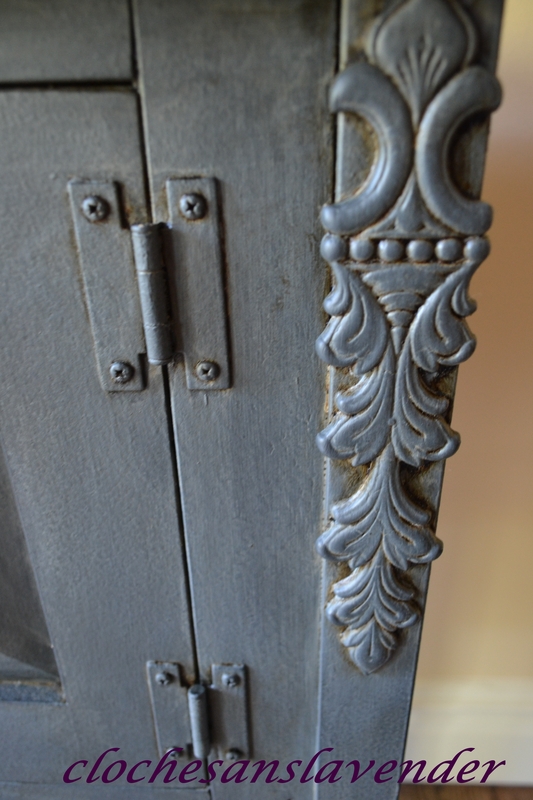 Gorgeous furniture pieces.